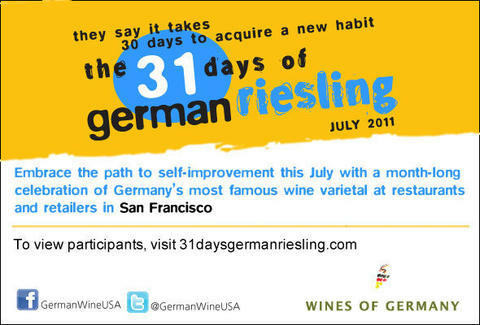 You can combat July's scalding heat by wearing jean shorts and carrying around a water-spraying fan, or you can refresh yourself with dignity intact, by joining in Wines of Germany's 31 Days of German Riesling. What was once Riesling Week has expanded into a month-long spectacular, giving you that much more time to savor the most rejuvenating member of the white wine family. Local restaurants from Michael Mina San Francisco to The Moss Room will commemorate this monumental stretch by offering custom pairing menus, by-the-glass specials, and premium flights, which unlike other flights don't require you to take off your shoes and belt. Retailers will also join the festivities with in-store tastings of the cool honey, citrus, and peach-flavored elixir -- a convenient way to honor Germany's greatest export that does not rhyme with Bowitzki. Ditch that awkward umbrella hat, stop hiding next to the AC, and check here to see which restaurants are participating in Wines of Germany's 31 Days of German Riesling.